This is the awesome Iwata HP-CS Airbrush. This multi-purpose, high-paint-flow, high-detail, gravity feed Eclipse Series airbrush sets the standard in versatility, reliability and performance. The Eclipse Series covers a wide range of uses, and does it all with just one needle and drop in nozzle, making this airbrush one of the most versatile paint tools on the market. 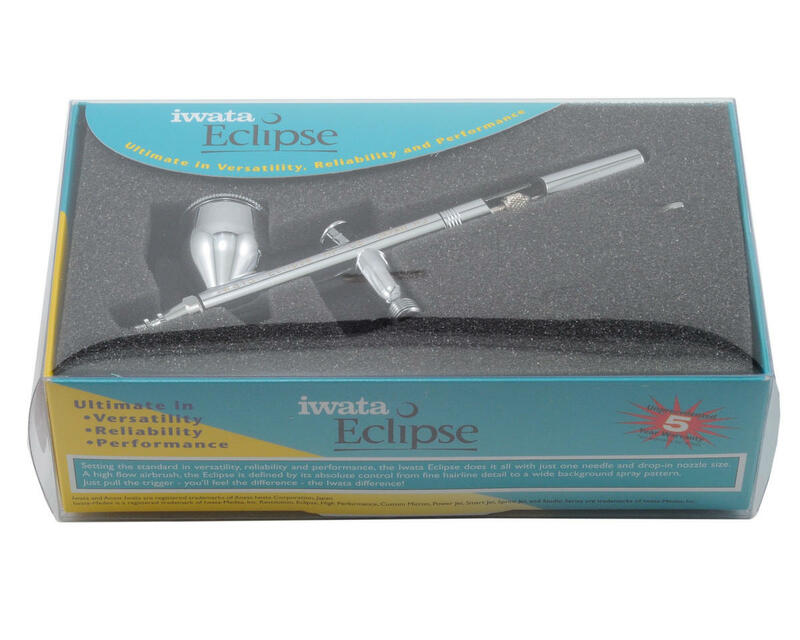 This Eclipse Series airbrush has established a new benchmark for excellence in an all purpose airbrush, by offering the ability to perform fine line detail work, as well as large surface area coverage. Commonly used to spray premixed or heavier paints, this high flow airbrush is well suited for uses demanding precise control of spray when applying moderate to large amounts of paint to a variety of surfaces and to various-sized areas. 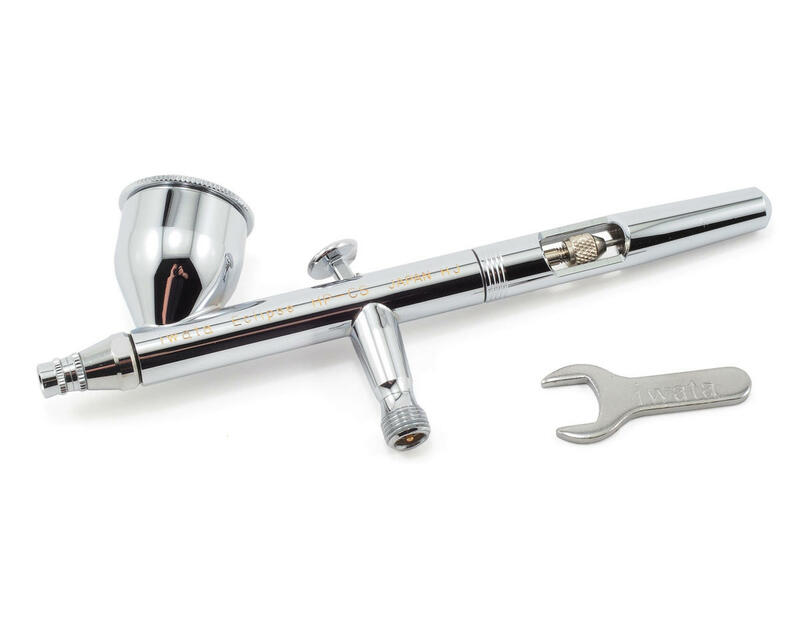 This gravity-feed airbrush features a unique 0.35-mm needle/nozzle combination for fine-detail spraying, but with high-paint-flow capacity. A Generous 1/3 oz. sized cup is designed with a new funnel shape, which makes for easy clean up and more efficient paint flow. Just pull the trigger and you will feel the difference - the Iwata difference! I'm fairly new to airbrushing. Started with an older suction feed brush and fought paint thickness/clogging and cleanup time. I just borrowed a buddies Iwata CS and WOW!! !, what a difference in ease of use and the quality of the paint job. Clean up time is minimal between colors, and the brush had no clogging issues even with unthinned paint in cold temperatures. Great fluid control with this piece, and the overall quality is very high. There will be one of these airbrushes in my near future! I’m not a pro but I’ve been airbrushing bodies for 12 years or so. I started with a dual action badger that was ok but not super smooth, made tbjust difficult enough that I went to a single action paasche and used it for a very very long time. Clean up on that one was a nightmare and I’m starting to do more bodies and trying to improve my skill level so I picked this up based on online reviews. Holy crap what a difference. This is by far the smoothest DA brush I’ve touched and clean up is a breeze. Sprays great patterns. Absolutely love it.